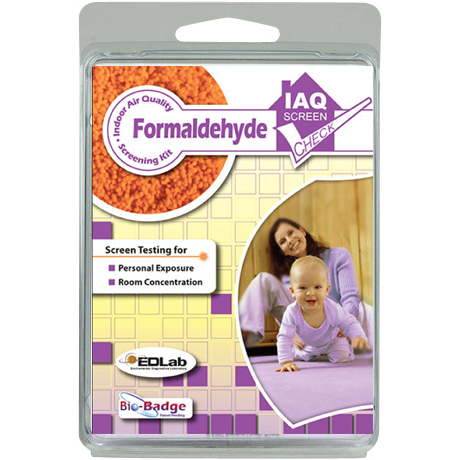 Formaldehyde Test Kit / Air Quality Test - Only $91.99! 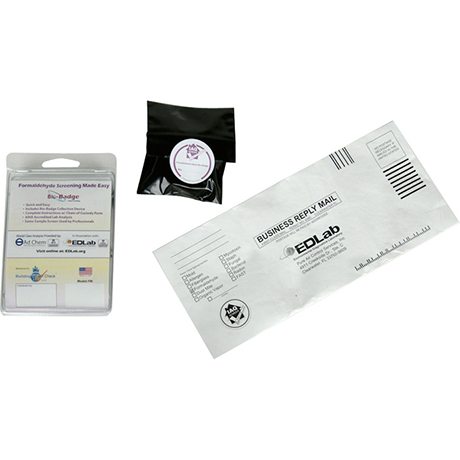 Take the badge out of the plastic bag and set it in your desired location for 24 hours to collect the sample. You may also attach the badge to your clothes. 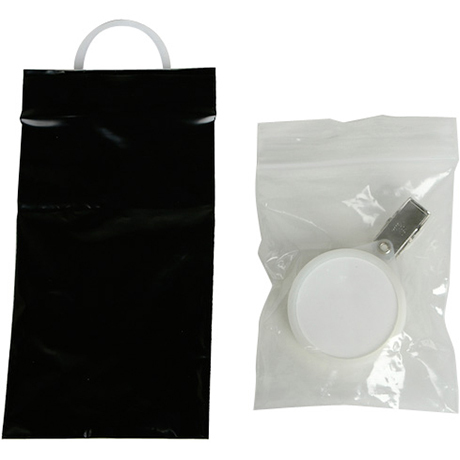 After 24 hours, put the badge back into the clear plastic bag and then put the clear plastic bag containing the badge into the black plastic bag. This will keep the sample from becoming damaged by light. Fill out the “Chain of Custody“ form. If you include your email address, you will receive the results by email. If you leave the email field blank, your results will be mailed to you. Mail the sample to the lab with the pre-paid envelope. Get results by email or mail within 1-3 weeks! The American Industrial Hygiene Association (AIHA) is a nonprofit organization recognized by the federal government to set the standards for labs to ensure they are using the proper equipment and certified technicians. Formaldehyde is a chemical compound used as a preservative by morticians and in labs. It is also found in common items like paints, markers, permanent pressed clothes, particleboard, fiberboard, carpets, upholstery, and cigarettes, to name a few. Formaldehyde is a colorless, strong-smelling gas. The majority of formaldehyde is created in naturally occurring processes in the atmosphere but can also be man-made by oxidizing methyl alcohol. What is a formaldehyde MSDS? MSDS stands for Material Safety Data Sheet. This is a document that states the health risks, physical properties, toxicity, hazards, and emergency response to a certain substance. A formaldehyde MSDS would contain these pieces of information specific to formaldehyde. Yes. Formaldehyde is considered a toxic substance. It can cause cancer and respiratory problems. However, in most cases the level of formaldehyde present in most items is low enough to be not harmful. How do I know if I have been exposed to formaldehyde? Common symptoms of formaldehyde are watery eyes, nausea, breathing difficulty, and a sensation of burning your eyes or throat. Your best bet is to conduct a formaldehyde test. It may be hard to determine if you smell formaldehyde without a frame of reference. It is a very pungent and unpleasant odor. The most likely source of formaldehyde you have encountered would be from dissecting a frog or a worm in school. Symptoms can begin to occur at levels of 0.1 ppm. Irritation of the eyes usually occurs at about 0.3 to 0.5 ppm. Levels above 0.5 ppm can begin to be hazardous. If you are concerned about harmful levels of formaldehyde in your home or workplace, the best thing you can do is test for formaldehyde. How does formaldehyde affect development in children? Studies show that low levels of formaldehyde will not adversely affect children’s development. It is only when exposure to high levels of formaldehyde that it becomes cause for concern. It is always good to perform a professional lab test if this is a concern. How can I reduce exposure to formaldehyde? Reducing your exposure is actually easier than you might think. You can do some very simple things like increasing ventilation and decreasing humidity. Running an air conditioner or dehumidifier is probably your best bet. Does your testing kit test for urea formaldehyde?